An audio recorder allows you to get your favourite music available for offline listening, and the program will help you to get any audio files you want from the online music resources or radio stations. There are a lot of audio recorders available on the Internet, but when people have a try, they can find out that the shareware provides more features than the free recorders. The price of the audio recorder shareware ranges from low to high, and many people are seeking for the most cost-effective one. If you are looking for the best cheap audio recorder which has powerful features and also does not burn a hole in your pocket, this post is just right for you. This post will introduce the best cheap audio recorder to all the people who want a perfect recording experience. Check it out. iMusic is one of the most reputed and best cheap audio recorder available online. It takes care of your entire audio recording needs at the most affordable price. You can also get free trial before you decide to pay for the subscription and get yourself a license for it. The following section will introduce the key features of this best cheap audio recorder and how to use it to record music. 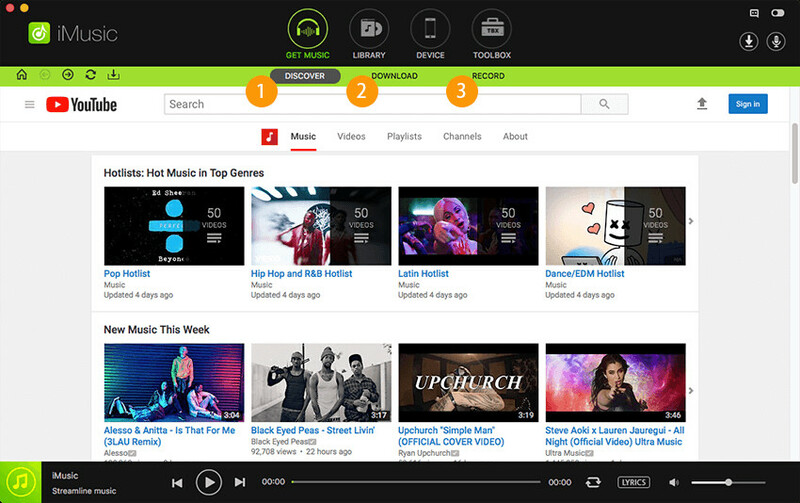 iMusic allows the user to record tracks from different online websites, and more than 10000 sites are supported by the program. The program enables users to transfer the recorded music files to their mobile devices with one click. iMusic will save the recorded music to its music library, so that the users can get access to the music files with ease. 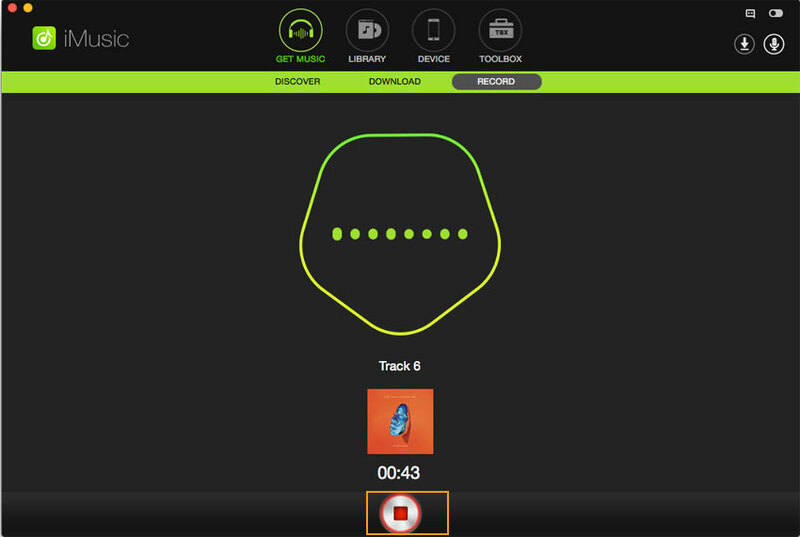 iMusic helps users to experience a hassle-free recording experience, because it offers a user-friendly interface. iMusic will automatically convert the file to MP3 audio files during the recording process. iMusic helps users to fix their music library, which helps to keep the music library organized. 1. iTunes 12 is finally bearable because of iMusic: Upgraded to iTunes 12 and found it unintuitive and ghastly hard to use, found an iTunes companion named iMusic and here I am overjoyed with the results. Thanks for making this wonderful program! 2. I am so impressed by the speed with which streaming is recorded and the music identified. Thereafter the transfer from iMusic to my record library is seamless and the clarity is superb. I highly recommend this product and congratulate iMusic on producing a program that as far as I am aware is unrivaled. The KeepVid team are also so quick to respond to emails and take a great deal of care in addressing user concerns. Start iMusic on your computer after the installation. Then you'll see the main interface of discovering music. Choose the RECORD option at the top middle of the software window, and click the Record button at bottom to let the program stand by. Then you can play the music file you need, and the program will automatically record it. Note: Please note that only when you click the Record button before playing music, the program can get the complete music info. When the audio file finishes playing, you can click the Record button again to finish the recording process. Then you can click the microphone icon at the upper right corner to view the recorded music files. Wondershare Streaming Audio Recorder is also one of the best cheap audio recorder programs because it is available to the user at a reasonable price for a single user personal license and its validity is lifetime. Hence once you purchase this, you don't have to worry about renewing the subscription or paying any amount again. The following section will introduce the key features of Wondershare Streaming Audio Recorder, and how to use this best cheap audio recorder to record the music you want. 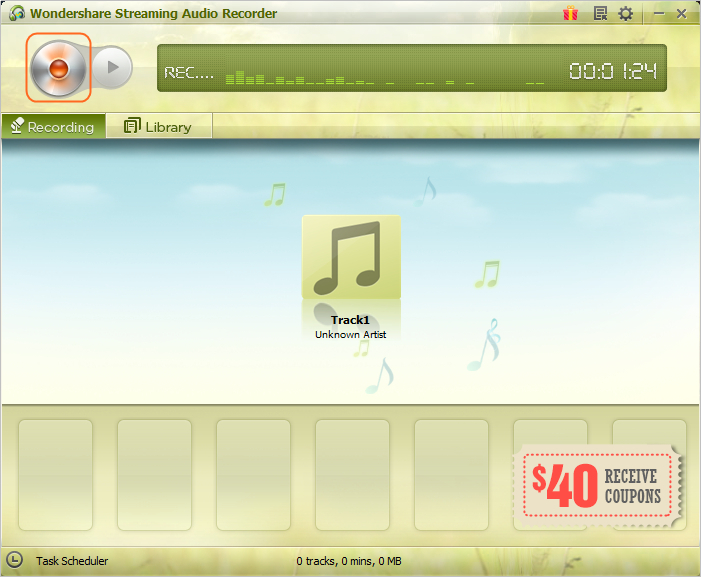 Wondershare Streaming Audio Recorder provides support to record any online track as long as it is playing. It gives support to record audios, as well as extract audios from video files. This software also provides support to record audio chats from Skype or other such audio and video chatting applications. There are no chances of dropouts or other errors when you record from Wondershare Streaming Audio recorder, which makes it the best cheap audio recorder available in the current software market. The software provides a Make Ringtone feature, and it helps users to make ringtones from the recorded music files. 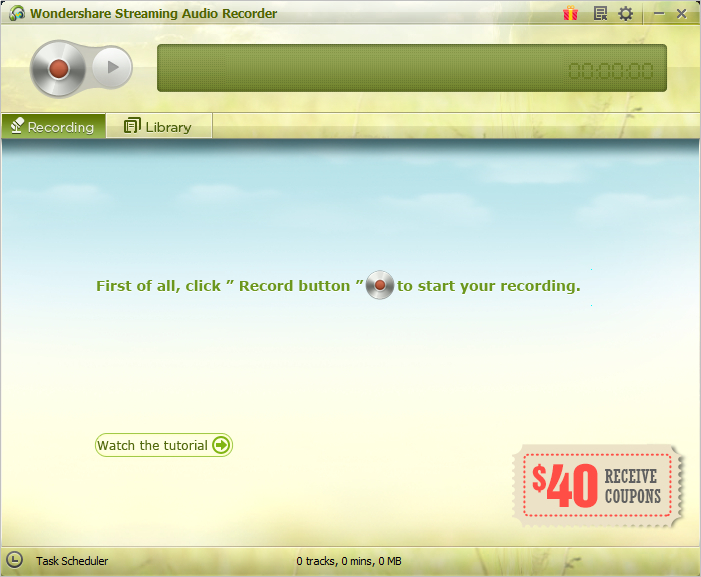 Wondershare Streaming Audio Recorder allows the user to get rid of pop up ads with the Advertisement Removal feature. The cheap audio recorder will save the recorded music to its music library, so that the user can get access to them with ease. 1. By far the best (well nearly): This is by far the easiest to use and the best quality streaming audio recorder out there, I know, I\'ve tried them all..! Just one word to the software devs, PLEASE, PLEASE add the missing ability to record at 320kbps, then this software really will be the ultimate streaming audio recorder..! 2. Works exactly as advertised: Installed it a few hours back, and it worked perfectly right out of the box. It has just finished recording my first Spotify playlist, 4.7 hours, 74 tracks, every split went perfect, just three unrecognized tracks that was easily edited. A very solid product, and highly recommended, five out of five stars! Download and install Wondershare Streaming Audio Recorder, then start it. 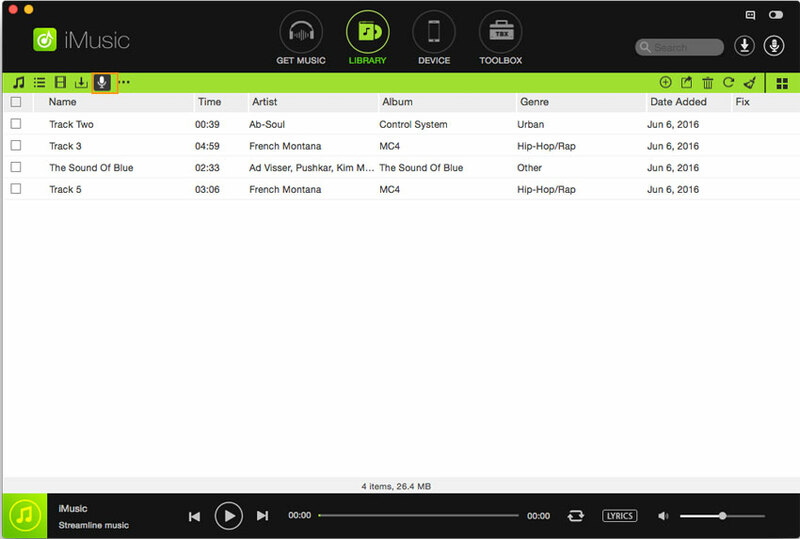 The program will display the main interface of recording music. Click the Record button at the upper left corner, and the program will get ready for recording. Then you can play the music file you need, and the program will record it. Please note that you should turn off all the other sounds playing on your computer, so that the program can get the music without disturbance. When the music file finishes playing, you can click the Record button again to finish the recording process. When the recoridng is done, the program will save the recorded file in its library. 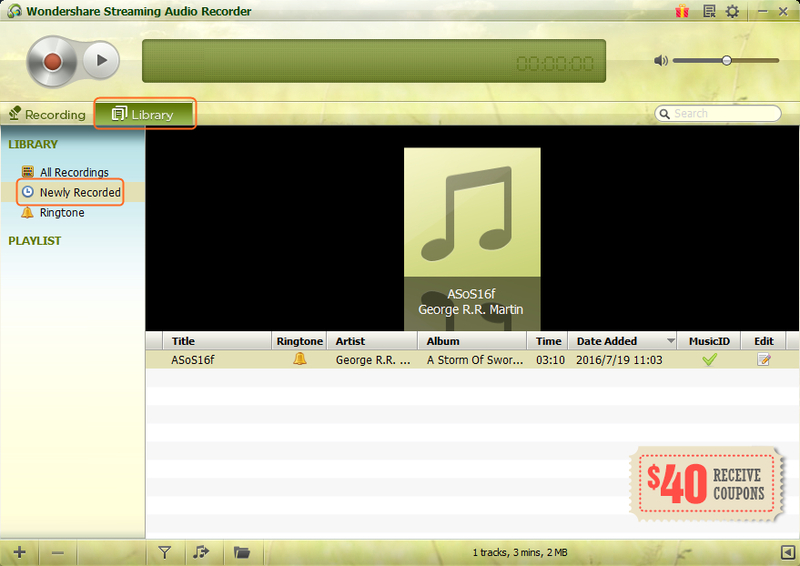 Choose Library and select the Newly Recorded playlist to view the recorded music files. When it comes to the audio recording task, many people also want to search for the free audio recorder, although they have much fewer functions than the shareware. This part will introduce one free audio recorder to you, and you can know how it works. This program is named FREE Audio Recorder, and it has a simple user interface. The guide below will show you how to use this voice recorder to record audio files on your computer. Download and install the FREE Audio Recorder on your computer. Then start it. The program shows you a very simple interface. Now click the round Record button at the upper left corner to let the recorder start working. Then you can play the audio file, and the program will record the audio file. Click the Pause button to stop the recording process, or you can click the Stop Recording button to finish the recording process. When the recording process finishes, you'll find the recorded audio files in your computer. The program will show you the path where the recorded file is saved. Conclusion: When comparing the best cheap audio recorder, iMusic, with the FREE Audio Recorder, you can easily find out that iMusic provides a lot more helpful features for the music fans, and the audio quality of the recorded files is much better than the free audio recorder. Therefore, the best cheap audio recorder is more useful than a free audio recorder.